Next month, if all goes according to plan, China will launch a spacecraft to the Moon. Their goal is to land the Chang’e-3 spacecraft on the Moon’s Bay of Rainbows and deploy a rover, and if the Chinese succeed it will be the first lunar soft landing since the mid-1970s, and the first rover on the Moon since 1973. It will also represent a significant technological achievement, and provide valuable scientific data. So far China has released a fair amount of information about Chang’e-3, including numerous photos of the lander and rover. The lander is big: 2.5 meters on a side, and 4.76 meters from one landing gear to the opposite one. Fully fueled its mass is 3800 kilograms and it is capable of delivering a 1700-kilogram payload to the Moon’s surface. It is not really big enough to carry humans, but it can carry much more payload than the relatively small rover it is hauling on this mission. There are still many unanswered questions about the mission. One of the more interesting ones is how the Chinese plan on keeping the lander and rover warm during the long lunar night. According to a paper by Sun ZeZhou, Jia Yan, and Zhang He in Science China (“Technological advancements and promotion roles of Chang’e-3 lunar probe mission”), the lander and rover are equipped with radioisotope heating units, or RHUs, using a two-phase heat transfer system. That is very good information. 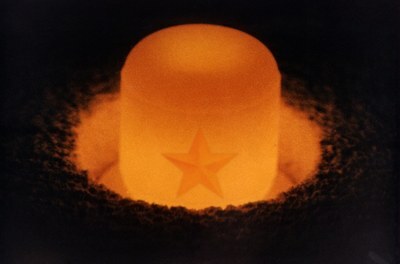 Wonder if any source can verify and clarify the chinese capabilities about PU-238 production, if its Pu-238 they are using, or clarify what the rover is actually using. I guess it seems to be a simple case of Russian collaboration and technology transfer, according to the russian article references posted there. -what material are you using? -where are you getting it from? -do you have plans to use it on future space missions? -are you planning on developing an RTG and for what mission? I expect that CE-4 will repeat the use of RHUs. And their sample return mission will probably do the same. Do they have a mission that will require an RTG? I have the Chinese doing a Polar Orbiter Solar Probe in 2023 and a Jupiter Orbiter in 2025 in my manifest. These missions could be done using solar panels, but having an RTG would allow for a more capable mission. In other news, the reviews done on November 8 approves the spacecraft for propellant filling - which I presume should have been completed by now. A member of 9ifly forum has made a 3-D animation of Chang'e-3 mission and loaded it on youtube. IMO, it's really nice work. He would very much appreciate it if you guys can give some comments and suggestions. A bad news: the animation maker POCKN said early this day in weibo(china's Twitter) that he cannot release the complete version of this animation for some reasons can't be told. Well the launch processing has gone all quiet (complete opposite to the processing of MAVEN! ), but the spacecraft has already been transferred to the launch pad for stacking! Yeah, what a shining example of Chinese space program's openness, where is the guy who claim China space program is more open then US commercial companies? As an aside from this thread's main topic, I have been following the Chinese programme since the first Dongfanghong launch in April 1970 and I never thought it would be as open as it is these days. I was in Hong Kong in 1975 and first came to mainland China in 1984. There have been lots of good changes here. China is modernizing. And thus, so can everywhere else. I'm optimistic about both our planet and Moon. It's all relative. As Jim Oberg has pointed out, the Chinese are far more open about their plans than the Soviets ever were during the Cold War. Of course, that doesn't mean that they are as open as the United States or ESA, even on civilian programs. And they release nothing on their military space programs. My impression is that the Chinese hurt themselves at times by either not being open, or not understanding what they need to do in order to be accepted as a serious player by other space powers. And some aspects of their program are hurting them, like the fact that their human space program is run by the PLA. That leads a lot of people to distrust them. But I do think they are learning. If you look at the papers from the last IAF congress in Beijing a few months ago, it is clear that the Chinese decided to present a lot of papers and release a lot of information on their activities. And they are being fairly open about Chang'e-3. No, what he claimed is Chinese space program has more openness than US commercial companies. Claiming China is more open than the US is simply absurd (and also off topic). Being "low-profile" is the nature of Chinese, nothing to do with government. Not sure what you're talking about here, everything in China is controlled by the party, there's no such thing in China as "nothing to do with government". And no, "low-profile" is not the nature of Chinese, have you even been to China and seen the # of BMW/Benz/Audi on the road? Furthermore, Pock n cannot proceed with his animation only because the copyright thing (go and check his post in 9ifly forum), nothing to do with the government, either. Yeah, right, like people really care about copyright in China. Also 9ifly forum is hosted in China, which means whoever runs the forum has to submit his personal information to the government and promise he has the resource to censor the forum 24x7 (just another example of everything in China is controlled by the party), so why should I trust anything posted on the forum? If you insist on talking about politics, you'd better choose another forum, like Pakistan Defense forum or something. I have no intention of starting politics discussion here, I'm simply offering an observation related to the Chinese space program, it is you who are trying to steer the topic away from this. If you define "openness" as the amount of government propaganda released via CCTV and other government channels, sure, why not, after all a major reason for their space program is to prove party's leadership is lawful and valid. But I define "openness" as people are allowed to say what's in their mind regarding the program, so I don't see much openness here. Wake me up when their journalists are allowed to post space news without going through censors. On November 20 Yuanwang 3 left Jiangyin and passed Shanghai to open seas in the morning of November 21. Two other ships departed Nov 16 and 19. My guess is that all the three ships began their support for Chang'e 3 launch. As of November 21, 12:44 UTC, the leading ship Yuanwang 6 was at 13.32°S, 142.67°E, some 100 nmi west of Guam. Don't know where Yuanwang 5 is right now. According to the latest report in vesselfinder http://www.vesselfinder.com/?imo=9413054 , Yuanwang 5 is already in east of Taiwan, under the planned flight route of Chang'e 3. Maybe an esteemed administrator could transfer all of the political discussion to a separate threat please? I never imagined that my innocent observation would lead to such discussions which are nothing to do with the Chang'e 3 mission. Why not just let the conversation play itself out and die? I think people call for censorship too quickly on this site. Besides, it's a valid question of what constitutes "openness" about the Chinese space program. I think they release a lot of information, and there's certainly a lot available on Chang'e-3. That doesn't mean that people in China are free to say whatever they want, but it's all relative, and part of the discussion here is deciding what we mean when we try to put these discussions on a spectrum. Let's keep this thread on-topic, please! 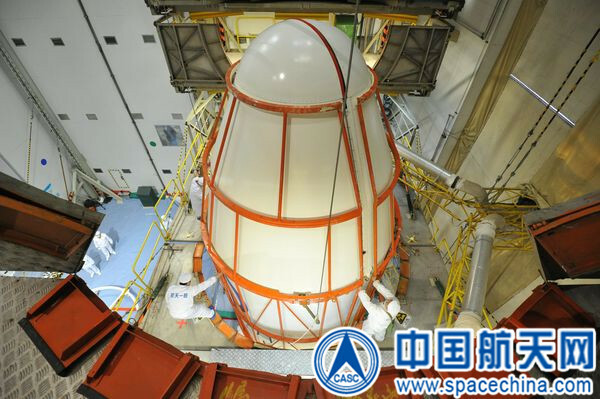 The spacecraft has already been stacked on the rocket and encapsulated, as expected from the processing time line. A CNSA press conference will be held early tomorrow - maybe by then we will get a launch time.